Want Big Laughs When You Hit The Stage? It’s always the punchlines that cause an audience to laugh — no matter what type of audience it may be. That’s why I want you to thoroughly understand why “conventional wisdom” about punchlines has little if any value and won’t help you reach your comedy goals. Do you want to discover how punchlines really work when developing a stand-up comedy act, speech or presentation? Let me introduce you to my new 21 page downloadable guide called Punchline Secrets – A Comprehensive Guide For Comedians & Speaking Pros. How are you supposed to be able to produce punchlines that work for a stand-up comedy routine, speech, or presentation if you don’t know what a punchline really is or how they are generated relative to your unique sense of humor and comedy talent? Important: While the information provided in the Punchline Secrets guide may be the most comprehensive available on the topic of punchlines, it should not be construed as a substitute for the Killer Stand-up Online Course. There is no fluff, no filler, no gimmicks involved with this professional guide — just solid, step-by-step actionable information that you can use and apply almost immediately. This concise, professional guide also includes links to access several additional free supplemental resources that will magnify your knowledge about the secrets, powerful techniques and unique strategies that Punchline Secrets has to offer. 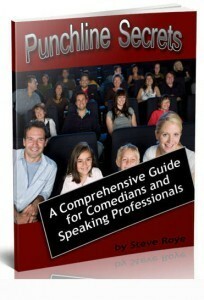 My new Punchline Secrets guide is available now for immediate download (PDF) for $17.99 just $12.99. FYI: The Punchline Secrets Guide is also available as a free bonus included in the popular audio series Stand-up Comedy Secrets for Beginners (the Complete Package). Without exaggeration — you will possess more solid, working knowledge about punchlines and set-up lines than 95%-99% of all working comedians or public speaking professionals today. 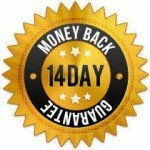 Punchline Secrets comes with my 14 day, NO RISK, NO QUESTIONS ASKED Money Back Guarantee. If my Punchline Secrets guide doesn’t deliver everything that I have said it would and more, simply email me and I will gladly refund your money — no questions asked. If you discover what punchlines are as they relate to you and your individual sense of humor, that means you would know what makes you funny when you talk. And if you actually know what makes you funny when you talk to other people, then common sense would suggest you would have a significant head start over other new comedians or speaking pro trying to generate laughs. If you attend ANY stand-up comedy open mic ANYWHERE in the world, you will see for yourself that the vast majority of new comedians don’t have so much as a clue about what makes them funny or how to craft what makes them funny into an act that will actually get laughs. This nuts-to-bolts audio series covers a wide variety of topics of interest to those wanting to seriously pursue stand-up comedy. The first two episodes in this series are available for review for free. Click here for more information about this popular audio series. I wish you the best in your comedy adventures – there is simply nothing more thrilling than causing an audience to howl with laughter! And I truly hope that you don’t struggle needlessly like most funny and talented people do, trying to “figure out” how to develop comedy material that actually generates big laughs from an audience.